Today I had the pleasure of making over the lovely Emily for her sorority pictures. We decided on a classic red lip and neutral, brown tones for the eyes so that she would stand out simply and beautifully in photos. 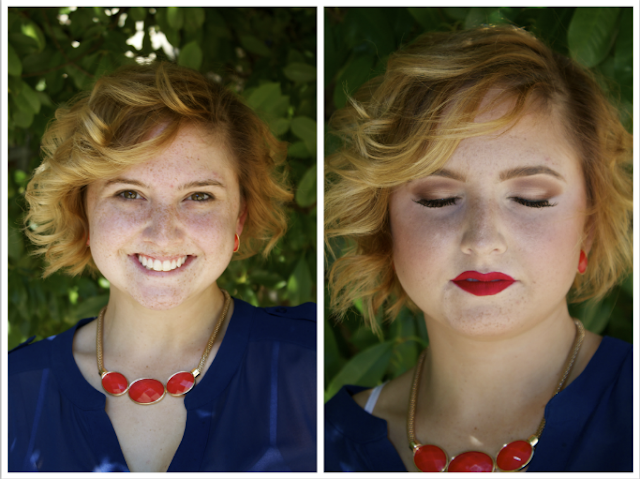 Her short, wavy hair complemented this makeup wonderfully and really lent to the "Marilyn Monroe" classic style we chose. I recently filmed a tutorial very similar to this look called "Hollywood Glam" on my YouTube Channel. Revlon Colorstay Whipped Foundation in "150"
MAC Prep + Prime Brightening Concealer Pen in "Radiant Rose"
MAC Eye Liner Pencil in "Teddy"
MAC Lip Liner in "Brick"
Lime Crime Velvetine Lipstick in "Red Velvet"